Welcome to the second base of a new weekly Clash of Clans series, featuring the best base design layouts for the home village and Builder Base. 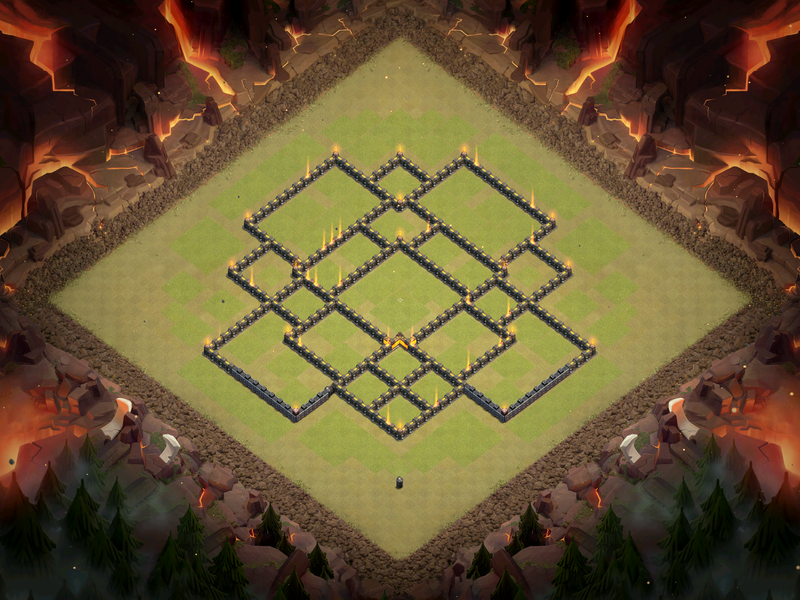 Today, our featured base layout is a TH10 design, that relies on an anti-two star design. This base is the best to use for Town Hall 10 during clan wars! Welcome back to our new Sunday series, and I hope you guys enjoy the base designs! When you unlock Town Hall 10, you get inferno towers which is an absolute huge advantage to you on defense in war. These inferno towers can shut down a whole array of strategies, depending on if you set them to multi or single target. Either way, we are going to play the inferno towers right in the core of this TH10 base layout, making sure that they can defend all strategies that might be attacking your base in clan wars! Here is the base that can defend at Town Hall 10, “the Turtle”! This Town Hall 10 war layout is meant to try and prevent the two star against fellow TH10s. We have a centralized clan castle, meant so that no troops can be lured out easily. Also, the two heroes, the barbarian king and archer queen both reside in the center of the base, protecting the Town Hall from destruction. LavaLoonion, one of the most popular strategies at Town Hall 10, will have a tough time against this base, due to the non-centralized air defense spread out in a square. Archer towers also are very centralized, making it tough for balloons to take out all the air-targeting defenses. Bowlers and miners, two more big strategies at TH10, will be hard-pressed to attack from the bottom due to the double, double giant bombs! Add all of this together and you have a pretty awesome Town Hall 10 war base! That’s all for our second weekly installment of daily base designs. I hope that all of you TH10s out there can use this base to wide success, allowing you to defending better in clan wars! If you want to see a base design for your BH or TH level, comment below which. Thanks for reading and come back soon for more Clash of Clans! Pingback: Best Town Hall 10 Base Design Layout: “The Turtle” | Clash of Clans Guide, Strategies, Tricks and More!